Widely used in today’s consumer electronics, lithium-ion batteries are now being adopted as a backup energy source for Uninterruptible Power Supplies (UPS) in data centers. In UPS applications, lithium-ion batteries can provide a savings in Total Cost of Ownership (TCO) of 10-30% over lead acid batteries over a 15-year UPS system life. While the initial capital cost is still slightly higher than lead acid batteries, they can provide significant TCO savings due to lower operating costs. They often have a longer predictable lifespan and cycle life, offer a reduced size and weight, and can operate at higher ambient temperatures. Also, lithium-ion batteries require little maintenance, and are less of an environmental hazard than lead acid batteries. In the next few years, they will play a much bigger role in UPS applications. Data center owners and colocation will have more secure power infrastructure due to the use of embedded blockchain technology in lithium-ion battery Management Systems (BMS). 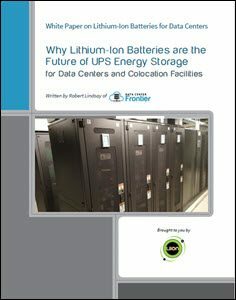 Download the new Data Center Frontier special report, in partnership with Liion, that explores the energy storage possibilities of lithium-ion batteries.